The Tokyo Motor Show would be amiss without its fair share of out-of-this-world concept cars, and this year Toyota takes the cake for what is probably the wackiest of them all. 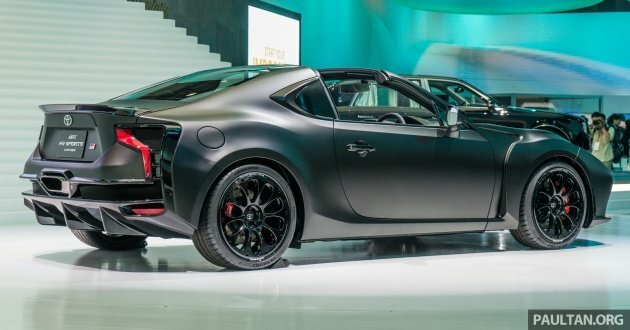 Based on the 86, the GR HV Sports concept features some pretty far-out ideas about preserving the joy of driving in ever more environmentally conscious society, and could serve as a pointer towards the company’s future sports cars. While the underlying bones of the donor sports car are clear to see, there are plenty of tweaks that mark the GR HV Sports out. First of all, it’s a targa, which is claimed to hark back to the Sports 800 and Supra. It also has a redesigned nose that makes the car a massive 155 mm longer than the 86; it’s also 30 mm wider. Many of the design cues have been lifted from the TS050 Hybrid prototype racer, with details such as the large vertical LED headlights, sizeable front air intakes, 19-inch ten-spoke aluminium wheels, slim tail lights and massive rear diffuser, plus gaping air vents in place of the original tail lights. There are fewer changes on the inside, save for the Gazoo Racing badge on the steering wheel and a digital instrument cluster. Look down, however, and you’ll notice something very peculiar – a manual H-pattern shifter (integrating the ignition button under a flip-up cover, like a jet fighter’s missile switch), despite there being a row of automatic gear selector buttons just below the head unit. Indeed, the GR HV Sports has an automatic transmission, but drivers can switch to manual shifting with just a push of a button, letting them enjoy the feel of a six-speed manual. Quite what form that transmission will take is unknown, whether a conventional six-speed auto or an electronic continuously variable transmission (eCVT) as on a Prius – or even the Multi-Stage Hybrid system found on the Lexus LS 500h and LC 500h. Engine details are also unknown, but Toyota says the GR HV Sports will utilise a new Toyota Hybrid System-Racing (THS-R) system, which is claimed to feature technology from the TS050. That car uses twin MGU-K (motor-generator unit-kinetic) units on each axle to recuperate energy usually lost under braking, juicing a lithium-ion battery instead of the capacitors that power its TS030 and TS040 predecessors. Sounds far-fetched? Don’t bet against it – this technology could find its way into the next 86, or even the new Supra. 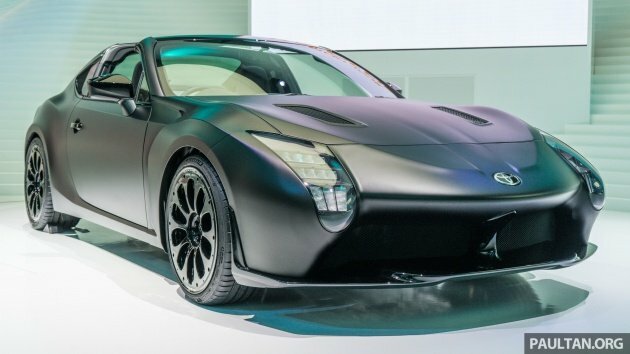 Toyota has long been rumoured to be keen on incorporating its Le Mans technology into its flagship sports car, and the GR HV Sports concept could be the first step towards that goal. Rebirth of the legendary Celica. Toyota the Legend Redefined. You won’t go wrong with Toyota. Everyone knows it. This is 2017 car, u can have both auto and manual, high tech, not like type R and new Impreza outdated old school only have shift stick manual like old saga and iswara early 80 90. Just admit you can’t drive stick instead of blaming the cars, nobody gonna look down on you. Be an honest boy ya. does it come with clutch pedal? if not, just a gimmick that most cars already have called Manual Gear selection in Automatic transmission. and guess what, it’d be slower than shifting an automatic kancil from d1 to whatever gear it has. and won’t compare with sequential. but good thing is you can do it like Daytona USA, 4th->1st-2nd around corners. This car looks mutated…from many weird parts.